So colossally ridiculous (and transparently derivative) that willing suspension of disbelief is a fool’s errand. 118 min. DreamWorks, Paramount Pictures. Director: D.J. Caruso. Cast: Shia LaBeouf, Michelle Monaghan, Rosario Dawson, Anthony Azizi, Billy Bob Thornton. Imagine if your ATM became a witness for your prosecution, your GPS turned sinister, and your wirelessly tapped cell phone could also transmit your conversations when the phone was off. Even a conspiracy nut might mind the scenario a bit hard to believe (at least in 2008), but in the age of executive-branch-approved wiretapping, the techno-thriller has only gained a certain frisson since its peak in the 1990s. So D.J. Caruso's Eagle Eye should have been entertaining B.S., but somehow his four screenwriters couldn’t come up with the proper underpinnings for their timely paranoid premise. 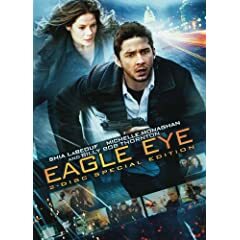 Eagle Eye begins in entertaining, semi-Hitchcockian fashion as it entwines Shia LaBeouf’s unaderachiever and Michelle Monaghan’s divorced mom into a terrorist plot by way of runaway technology. Having just buried his overachieving military-man twin brother Ethan, Jerry Shaw is in an especially self-pitying mood. Hiding out from life with a job at a Copy Cabana and a cheap apartment he can barely afford, Jerry can't believe his luck when an ATM spits out thousands of dollars. He also can't believe his luck when he returns home to discover he's been delivered drums of explosive material. A cell phone call from a mysterious female voice instructs him to run, but he's instantly captured by the FBI and subject to interrogation by Agent Thomas Morgan (the always welcome, always laconic Billy Bob Thornton). Meanwhile, shortly after putting her son on a train to Washington, D.C., Rachel Holloman (Michelle Monaghan) begins receiving threatening phone calls from the same voice. Before long, the omniscient voice has successfully directed Jerry through an escape from custody and united the two hapless strangers on a direct course to what looks like a nasty domestic terrorist event. The voice has ways of making the two continue, including a mortal threat to Rachel's son, Sam (Cameron Boyce). Michael Chiklis is on hand as a Secretary of Defense dealing with the fallout from a mistake in Baluchistan (you read that right), and Rosario Dawson and Anthony Mackie play a stalwart FBI Special Agent and a stalwart Pentagon-based Army officer, respectively. Caruso (who last directed LaBeouf in Disturbia) is an effective director of action, and he's attentive to the emotional arcs of his leading characters, though his choice of stylized blue filtering is an annoyance. While it all pushes credibility to a limit, Eagle Eye leaps over the edge when it reveals the force behind the conspiracy, making the flick so colossally ridiculous (and transparently derivative) that willing suspension of disbelief is a fool’s errand. Perhaps this fundamental plot mistake wouldn’t be such an issue if Eagle Eye’s crack action trappings were more memorable, but even casual moviegoers will recognize the re-installed spare parts of better movies, particularly a Stanley Kubrick picture I won't name but that will be blindingly obvious to anyone who sees Eagle Eye. This paranoid thriller is less interested in the political than it is in the technological, but executive producer Steven Spielberg would have done better to advance his storyline into the future as he originally intended. Just because you get Leslie Stahl (in a cameo) to say it's true doesn't mean we'll buy it...nice try, though. 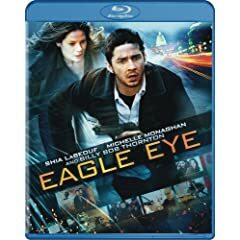 Paramount delivers a thorough special edition for Eagle Eye on Blu-ray and DVD. For starters, we get a very slick transfer that exactingly recreates the source material. Color is spot on, detail is excellent, and the slam-bang action never wavers with any digital artifacting. The Dolby TrueHD 5.1 surround soundtrack captures every crash, crunch, and gunshot in startling clarity and with well-applied discrete surround effects. The disc's special features branch out in a number of interesting directions. In the behind-the-scenes category, four "Deleted Scenes" (4:39, HD) lead the pack, followed by "Asymmetrical Warfare: The Making of Eagle Eye" (25:32, HD). There's nothing quite like a making-of featurette with its onset footage in glorious HD, as well as interviews with producers Alex Kurtzman and Roberto Orci, director D.J. Caruso, Shia LaBeouf, DP Dariusz Wolski, Michelle Monaghan, special effects coordinator Peter Chesney, second unit director Brian Smrz and production designer Tom Sanders. "Eagle Eye on Location: Washington, D.C." (5:58, HD) keeps the fun coming by looking at the shoots at the Library of Congress and the Pentagon. Caruso, co-producer Pete Chiarelli, Library of Congress Director of Communications Matt Raymond, Kurtzman, and Michael Chiklis wax enthusiastic. Moving into the social arena, the special edition serves up "Is My Cell Phone Spying on Me?" (9:14, HD), a think piece of sorts about the encroaching role of technology in our culture, with Monaghan, Chiklis, LaBeous, Kurtzman, Caruso, Chiarelli, University of Wisconsin-Milwaukee assistant professor Michael Zimmer, Executive Director of the Electronic Privacy Information Center Marc Rotenberg, and producer Edward McDonnell. The most entertaining feature, "Shall We Play a Game?" (9:22, HD) puts Caruso in conversation with his mentor John Badham, director of War Games. The two trade compliments while discussing some of the unique challenges and common themes of their respective films. "Road Trip" (3:05, HD) seems to be a sizzle reel (perhaps for ShoWest? ); nominally, it deals with the film's ever-moving location shoots--particpants include Caruso, LaBeouf, Monaghan, Orci, Kurtzman, and Sanders. There's a profane (bleeped) "Gag Reel" (7:00, HD) that shows Billy Bob Thornton taking out his frustration with hilarious improvised rants, a Photo Gallery, and the "Theatrical Trailer" (2:35, HD). It's another fine, full-HD special edition from Paramount, one that will make the film's fans very happy. All site content © 2000-2019 Peter Canavese. Page generated at 04/19/2019 04:03:29AM.